The most imposing house in Leonard Stanley, The Priory Farm House, dates from around 1750. It was built by the wealthy land owner and wool merchant Robert Sandford, with whose descendants ownership remained until it passed from the Cumberland-Jones' to the present family around 1930. 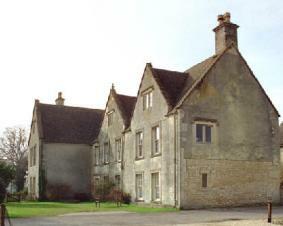 The house is constructed, walls and roof, of Cotswold Lime Stone hewn locally. This stone lies at the core of the Cotswold Hills and was extensively used in all kinds of building. In recent years cost has prohibited its continued use as a building material except where aesthetics over-rule economics. Click Here for Wikipede details. Click Here for full details by Historic England. The Sandford Coat-of-Arms is still seen high on the front elevation. Behind St. Swithun's Parish Church, in the Priory Farm yard, is a stone building that dates from around the year 1000. It was dedicated to St. Swithun, Bishop of Winchester, who died in 952. 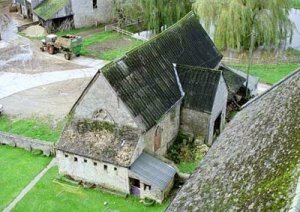 It is in remarkable condition, possibly because the Priory always found a use for it - from the mid 16th Century, to this day, it has been used as a farm building. From early times the clergy and the church were maintained by the offerings of the people. At a time which is not precisely known, but certainly by 786 A.D., this custom was replaced by tithing, the payment of one tenth of all the produce of the land, and enforced by law throughout England by 900 A.D. The tithe was paid to the person who was responsible for ensuring that a priest was placed in a parish. The person in the parish was called a 'vicar' (from the word 'vicarious') who represented his appointer to whom the tithe was paid, called the 'rector'. 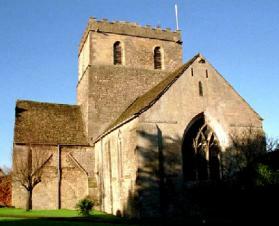 The Rector of Leonard Stanley was the Abbott of the priory (monastery) in the parish. At the time of the Priory the tithe would have been paid 'in kind', as animals or crops. A place was therefore needed in which to store the dry produce of grain and hay, and so a barn was built in which to store the tithe. Hence the name 'Tithe Barn'. In later years the tithe was collected as a form of tax, and was the cause of considerable ill feeling. The remaining vestiges of the tithing system came to an end as late as 1996. 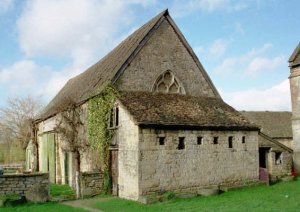 The present Parish Church is almost as old, dating from 1129, and was part of a priory building complex (monastery) the rest of which, apart from the tithe barn, has long since disappeared. The Chapels that once extended to the east of each transept, together with the cloister, have gone. Traces of a chapel, once built onto the south transept, are to be seen in the blocked arch, and roof line above the arch. An additional level has been added to the tower. And most of the windows have been enlarged. Nevertheless the building as we now have it is still the one erected 870 years ago, the walls, and all but the top storey of the tower, are original. 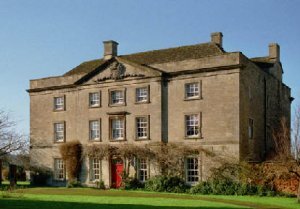 The Grange was built by a merchant, Richard Clutterbuck, and was called 'Townsend House'. A carved stone porch in Stroud Museum carries the initials RC and the date 1583. When first built the house had two gables on the south face. A third gable was added as part of a west wing extension around the year 1680. Toward the end of the 17th Century the stone mullioned windows were replaced with the present sash windows. The interior was remodelled in the late 19th Century. Its name was changed, in 1861', to 'The Grange'. There exists an almost complete history of the occupants In 1958 the house ceased to be in the sole occupancy of one family and was converted into three dwelling units, the west wing (pictured below) became a house and the rest two apartments. Much of the building's basic structure remains original, oak beams may be seen in the rooms, oak trusses in the attic, oak plank floors in the upper storeys, and wattle and daub partitions now mostly covered by lath and horse hair plaster in Victorian times.